Lazarus is one of my current favorites. It's exciting, emotionally driven and full of crazy-world-order-awesomeness. Up to this point in the story the Carlyle family Lazarus known as Forever has believed herself the daughter of the family patriarch. Most of the world leaders have Lazarus in their families and right at the end of issue 14, Forever was set to fight one of them who she had befriended. She fights for the Hock families patriarch to be slated as guilty. The crime? Killing a member of the Carlyle family and stealing the scientific secrets of longevity. The key to eternal life. This issue is going to throw some surprises at you and one hell of combat scene making this one of the quickest Lazarus issues I've ever read...there's very little to actually read but lots of panels to appreciate. 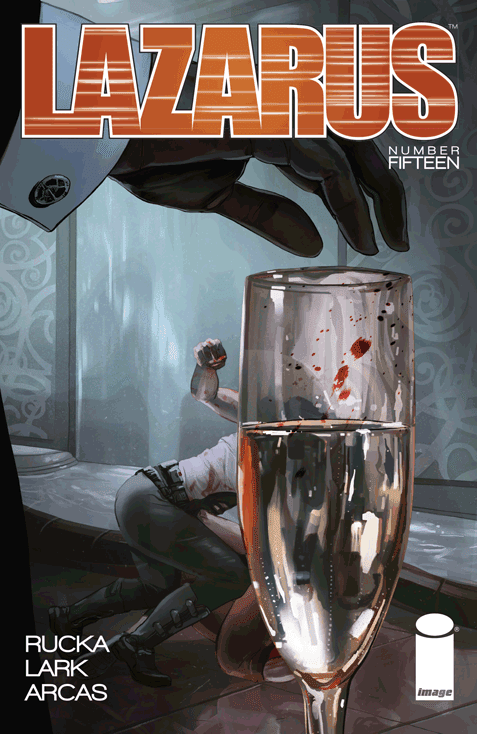 Of course there's also a big cliff hanger, thanks Rucka. The whole eternal life thing is pretty damn awesome but I have to admit that I'm a really big fan of this new world order. Only in the story...not that I want it to actually happen. The world is divided, and so is the countryside, into territories owned by families. The populace is again divided into family members, citizens and surfs. The surfs have it pretty bad. Generally living in poverty and full of hatred for the family that commands their land. The first two story-arcs of the series focused more on these surfs and how Forever must deal with them despite any emotions she may have to the contrary. Sometimes she must punish them for insubordination, stealing, or conspiracy. Forever as a character is extremely complex and real.